There are many 3D printing projects available on the web, but there is one in particular that really impressed me. 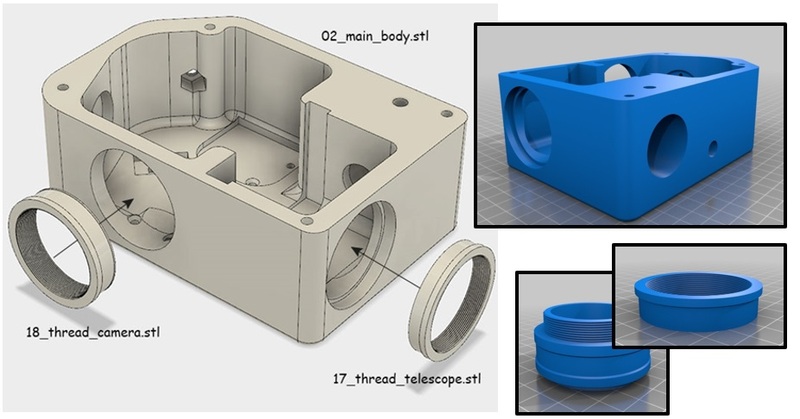 The project we will discuss today allows you to print all the structural components of a spectroscope at home and then adapt the lenses and the mechanical parts (for the movement mechanisms) obtaining an instrument to use at home, perhaps connecting it to a telescope. 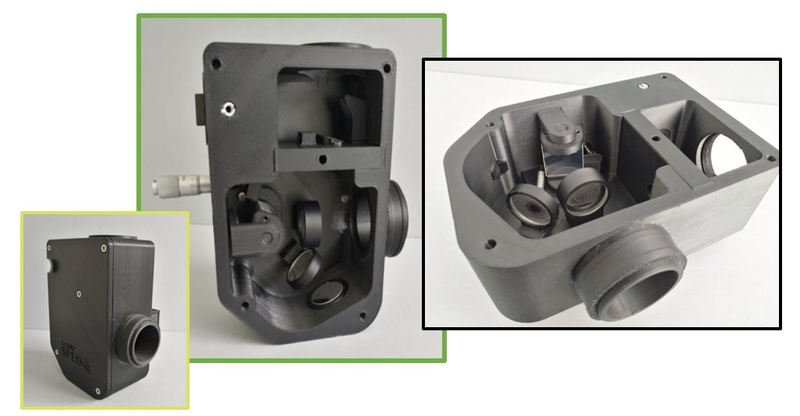 The project was realized a few months ago by Paul Gerlach who published on Thingiverse (see here) all the files necessary for printing the components of the spectroscope. The author of the project really presents his project in a professional manner and has launched an invitation to everyone to realize his project at home and maybe to improve it. Paul Gerlach has created this project to have at his disposal at low cost (around 500 euros) a real spectroscope to be used in various ways. One of the suggested applications is that of astronomical observation. In fact, connecting it to a telescope should allow the study of the emission spectrum of celestial bodies. 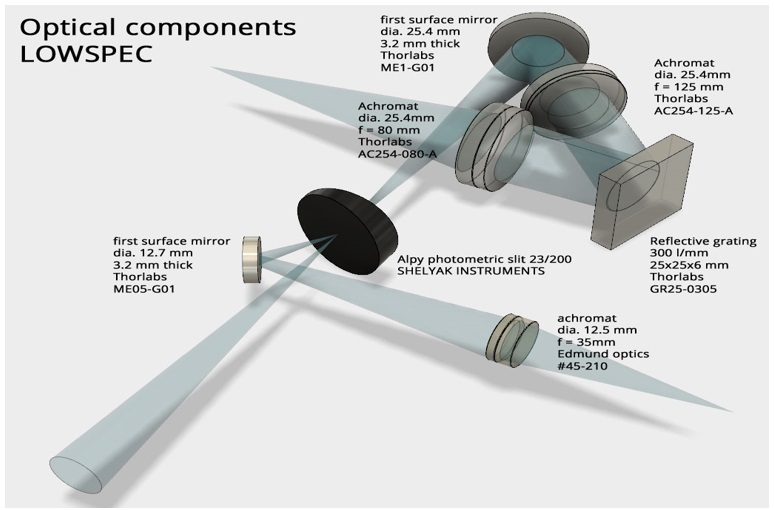 In particular, the project at the present time has been designed to be applied to telescopes that are f / 8 or lower. 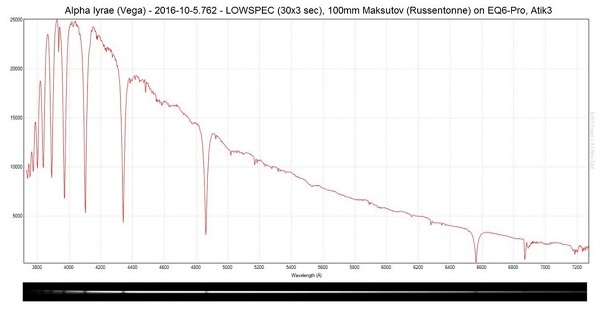 In the following figure a spectrogram of the Vega star obtained with the LOWSPEC spectroscopes. The printer used is a Felix Pro 2, with a resolution of 0.1-0.2 mm and an infill value between 50-80%. 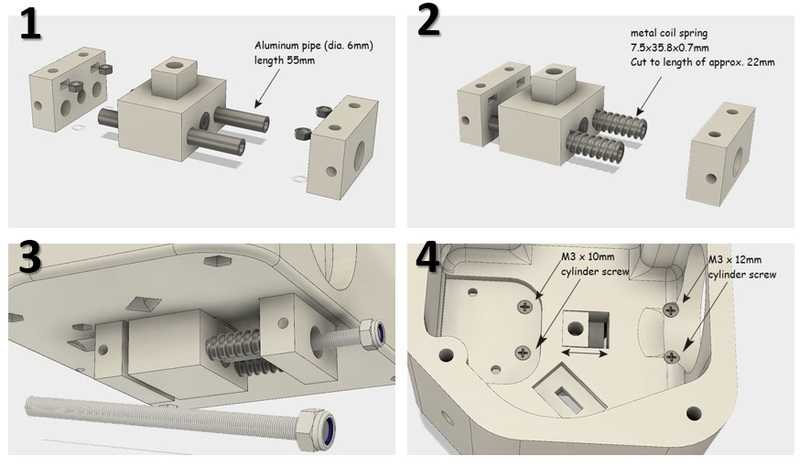 Some parts in the project require supports to be printed. The hardware necessary for the realization of the spectroscope was superbly represented by an image. 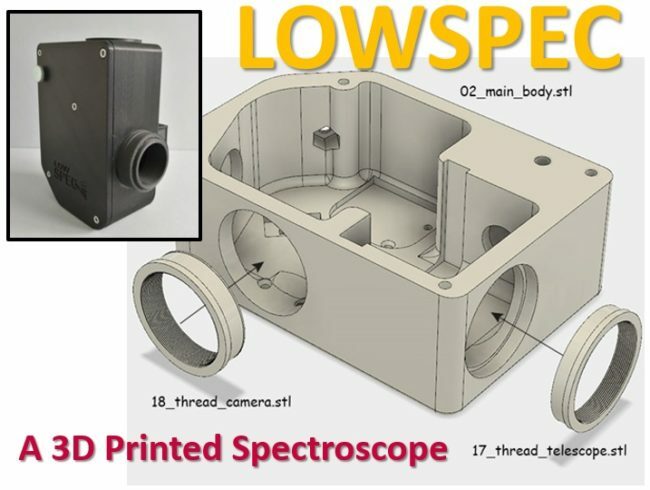 In the Thingiverse page all the steps are explained in detail to assemble the spectroscope step by step. In this article only some descriptive images are shown, this only for explaining the project and better understanding its validity. For those interested more I recommend to visit the official page. Here is the representation of the 3D model corresponding to the spectroscope case, with the names of the corresponding STL files. In special way, the assembling of the various mechanical parts regulating the lenses movement is also explained in detail. In the end, if you have followed the instructions well, you will obtain a spectroscope like the one shown in the figure.